Re-enter the world of Street Fighter and meet up with everyone’s all time favourite classic heroes, Ryu, and his friends Ken, Chun Li and many more. Join Ryu on his travels as he meets with a myriad of characters, both familiar and some new faces, with various fighting styles and techniques. Looking for a fight? Take on your opponents in a one on one combat! 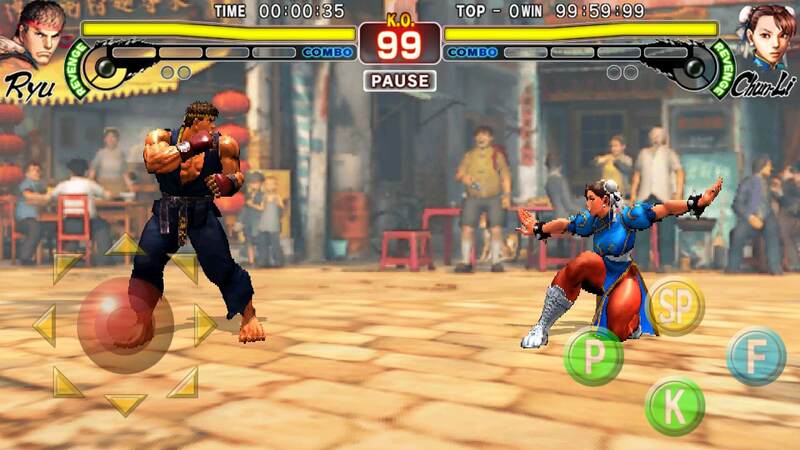 As with the original Street Fighter game, the game starts with each player on the left and right sides of the screen. 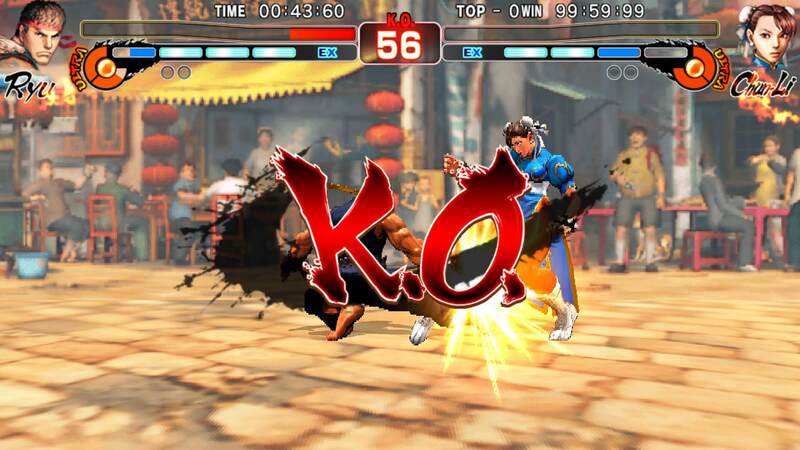 The objective is to decrease the other player’s health bar to zero and knock their fighter out. Typically, every round will have a time limit, and the player with the most health when the time is up wins. The first player to win two rounds wins the entire match. In classic arcade fashion, you will have a “joystick” on the left to control the fighter’s movements and four buttons on the right for kicks, punches, and special moves. During a match, your Revenge gauge fills up as you take damage. When you have filled it more than halfway, an Ultra Combo will be available. Tap on the Ultra mark that is on fire to execute it. 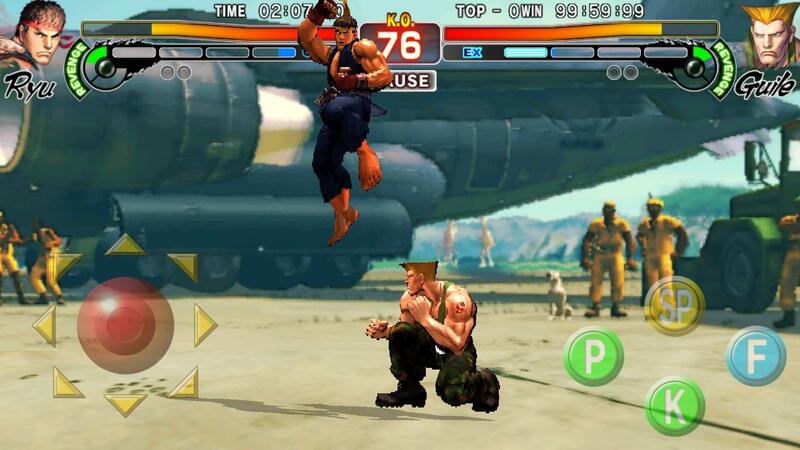 You can also tap on your opponent’s Revenge gauge to activate an Ultra combo. The strength of the Ultra Combo corresponds with how much your Revenge Gauge is filled up. The Super Combo, on the other hand charges up as you land blows on your opponent. Charge it to the maximum and tap to unleash a Super Combo to deal loads of damage. Besides using a Super Combo, which completely drains the gauge, you can also choose to use the gauge for things like EX Special Move and EX Focus Attack. These are enhanced moves from your basic move set, and depletes a fourth or half of the Super Combo gauge respectively. Similar to Revenge gauge, you can tap on your opponent’s gauge, too, to use a Super Combo. Aside from the kick, punch and special buttons, there is another button on the right of your screen which is for the Focus Attack. These are attacks where you can charge up to three levels, and their power increases with each level. You can take up to one attack while charging before being interrupted and losing the charge. Do note that the downloadable mobile game only has limited access to the game, and you will have to purchase the “Champion Pack” to unlock the full game with all the playable characters and game modes. Otherwise, you will only be able to play the arcade mode in the Solo play mode, and pick one of the four available main characters only. If you are a fan of fighting games, and are looking for a mobile version of the Street Fighter IV game from consoles, why not give this one a shot?